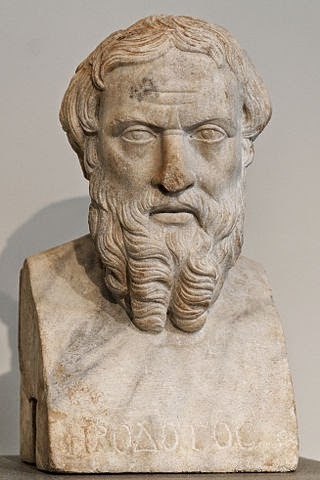 Herodotus (c. 484–425 BC), An Account of Egypt: Being the Second Book of His Histories Called Euterpe. All phases of life were pictured by Herodotus in his history. Like a modern newspaper reporter, he combines weird stories, scandals, and battle accounts with descriptions of places, persons, and sights about town. WHEN Cyrus had brought his life to an end, Cambyses received the royal power in succession, being the son of Cyrus and of Cassandane the daughter of Pharnaspes, for whose death, which came about before his own, Cyrus had made great mourning himself and also had proclaimed to all those over whom he bore rule that they should make mourning for her: Cambyses, I say, being the son of this woman and of Cyrus, regarded the Ionians and Aiolians as slaves inherited from his father; and he proceeded to march an army against Egypt, taking with him as helpers not only the other nations of which he was ruler, but also those of the Hellenes over whom he had power besides. Now the Egyptians, before the time when Psammetichos became king over them, were wont to suppose that they had come into being first of all men; but since the time when Psammetichos having become king desired to know what men had come into being first, they suppose that the Phrygians came into being before themselves, but they themselves before all other men. Now Psammetichos, when he was not able by inquiry to find out any means of knowing who had come into being first of all men, contrived a device of the following kind:—Taking two new-born children belonging to persons of the common sort he gave them to a shepherd to bring up at the place where his flocks were, with a manner of bringing up such as I shall say, charging him namely that no man should utter any word in their presence, and that they should be placed by themselves in a room where none might come, and at the proper time he should bring to them she-goats, and when he had satisfied them with milk he should do for them whatever else was needed. These things Psammetichos did and gave him this charge wishing to hear what word the children would let break forth first, after they had ceased from wailings without sense. And accordingly so it came to pass; for after a space of two years had gone by, during which the shepherd went on acting so, at length, when he opened the door and entered, both the children fell before him in entreaty and uttered the word bekos, stretching forth their hands. At first when he heard this the shepherd kept silence; but since this word was often repeated, as he visited them constantly and attended to them, at last he declared the matter to his master, and at his command he brought the children before his face. Then Psammetichos having himself also heard it, began to inquire what nation of men named anything bekos, and inquiring he found that the Phrygians had this name for bread. In this manner and guided by an indication such as this, the Egyptians were brought to allow that the Phrygians were a more ancient people than themselves. That so it came to pass I heard from the priests of that Hephaistos who dwells at Memphis; but the Hellenes relate, besides many other idle tales, that Psammetichos cut out the tongues of certain women and then caused the children to live with these women. With regard then to the rearing of the children they related so much as I have said: and I heard also other things at Memphis when I had speech with the priests of Hephaistos. Moreover I visited both Thebes and Heliopolis for this very cause, namely because I wished to know whether the priests at these places would agree in their accounts with those at Memphis; for the men of Heliopolis are said to be the most learned in records of the Egyptians. Those of their narrations which I heard with regard to the gods I am not earnest to relate in full, but I shall name them only, because I consider that all men are equally ignorant of these matters: and whatever things of them I may record, I shall record only because I am compelled by the course of the story. But as to those matters which concern men, the priests agreed with one another in saying that the Egyptians were the first of all men on earth to find out the course of the year, having divided the seasons into twelve parts to make up the whole; and this they said they found out from the stars: and they reckon to this extent more wisely than the Hellenes, as it seems to me, inasmuch as the Hellenes throw in an intercalated month every other year, to make the seasons right, whereas the Egyptians, reckoning the twelve months at thirty days each, bring in also every year five days beyond the number, and thus the circle of their seasons is completed and comes round to the same point whence it set out. They said moreover that the Egyptians were the first who brought into use appellations for the twelve gods and the Hellenes took up the use from them; and that they were the first who assigned altars and images and temples to the gods, and who engraved figures on stones; and with regard to the greater number of these things they showed me by actual facts that they had happened so. They said also that the first man who became king of Egypt was Min; and that in his time all Egypt except the district of Thebes was a swamp, and none of the regions were then above water which now lie below the lake of Moiris, to which lake it is a voyage of seven days up the river from the sea: and I thought that they said well about the land; for it is manifest in truth even to a person who has not heard it beforehand but has only seen, at least if he have understanding, that the Egypt to which the Hellenes come in ships is a land which has been won by the Egyptians as an addition, and that it is a gift of the river: moreover the regions which lie above this lake also for a distance of three days’ sail, about which they did not go on to say anything of this kind, are nevertheless another instance of the same thing: for the nature of the land of Egypt is as follows:—First when you are still approaching it in a ship and are distant a day’s run from the land, if you let down a sounding-line you will bring up mud and you will find yourself in eleven fathoms. This then so far shows that there is a silting forward of the land. Then secondly, as to Egypt itself, the extent of it along the sea is sixty schoines, according to our definition of Egypt as extending from the Gulf of Plinthine to the Serbonian lake, along which stretches Mount Casion; from this lake then the sixty schoines are reckoned: for those of men who are poor in land have their country measured by fathoms, those who are less poor by furlongs, those who have much land by parasangs, and those who have land in very great abundance by schoines: now the parasang is equal to thirty furlongs, and each schoine, which is an Egyptian measure, is equal to sixty furlongs. So there would be an extent of three thousand six hundred furlongs for the coastland of Egypt. From thence and as far as Heliopolis inland Egypt is broad, and the land is all flat and without springs of water and formed of mud: and the road as one goes inland from the sea to Heliopolis is about the same in length as that which leads from the altar of the twelve gods at Athens to Pisa and the temple of Olympian Zeus: reckoning up you would find the difference very small by which these roads fail of being equal in length, not more indeed than fifteen furlongs; for the road from Athens to Pisa wants fifteen furlongs of being fifteen hundred, while the road to Heliopolis from the sea reaches that number completely. From Heliopolis however, as you go up, Egypt is narrow; for on the one side a mountain-range belonging to Arabia stretches along by the side of it, going in a direction from the North towards the midday and the South Wind, tending upwards without a break to that which is called the Erythraian Sea, in which range are the stone-quarries which were used in cutting stone for the pyramids at Memphis. On this side then the mountain ends where I have said, and then takes a turn back; and where it is widest, as I was informed, it is a journey of two months across from East to West; and the borders of it which turn towards the East are said to produce frankincense. Such then is the nature of this mountain-range; and on the side of Egypt towards Libya another range extends, rocky and enveloped in sand: in this are the pyramids, and it runs in the same direction as those parts of the Arabian mountains which go towards the midday. So then, I say, from Heliopolis the land has no longer a great extent so far as it belongs to Egypt, and for about four days’ sail up the river Egypt properly so called is narrow: and the space between the mountain-ranges which have been mentioned is plain-land, but where it is narrowest it did not seem to me to exceed two hundred furlongs from the Arabian mountains to those which are called the Libyan. After this again Egypt is broad. Such is the nature of this land: and from Heliopolis to Thebes is a voyage up the river of nine days, and the distance of the journey in furlongs is four thousand eight hundred and sixty, the number of schoines being eighty-one. If these measures of Egypt in furlongs be put together, the result is as follows:—I have already before this shown that the distance along the sea amounts to three thousand six hundred furlongs, and I will now declare what the distance is inland from the sea to Thebes, namely six thousand one hundred and twenty furlongs: and again the distance from Thebes to the city called Elephantine is one thousand eight hundred furlongs. Of this land then, concerning which I have spoken, it seemed to myself also, according as the priests said, that the greater part had been won as an addition by the Egyptians; for it was evident to me that the space between the aforesaid mountain-ranges, which lie above the city of Memphis, once was a gulf of the sea, like the regions about Ilion and Teuthrania and Ephesos and the plain of the Maiander, if it be permitted to compare small things with great; and small these are in comparison, for of the rivers which heaped up the soil in those regions none is worthy to be compared in volume with a single one of the mouths of the Nile, which has five mouths. Moreover there are other rivers also, not in size at all equal to the Nile, which have performed great feats; of which I can mention the names of several, and especially the Acheloös, which flowing through Acarnania and so issuing out into the sea has already made half of the Echinades from islands into mainland. Now there is in the land of Arabia, not far from Egypt, a gulf of the sea running in from that which is called the Erythraian Sea, very long and narrow, as I am about to tell. With respect to the length of the voyage along it, one who set out from the innermost point to sail out through it into the open sea, would spend forty days upon the voyage, using oars; and with respect to breadth, where the gulf is broadest it is half a day’s sail across: and there is in it an ebb and flow of tide every day. Just such another gulf I suppose that Egypt was, and that the one ran in towards Ethiopia from the Northern Sea, and the other, the Arabian, of which I am about to speak, tended from the South towards Syria, the gulfs boring in so as almost to meet at their extreme points, and passing by one another with but a small space left between. If then the stream of the Nile should turn aside into this Arabian gulf, what would hinder that gulf from being filled up with silt as the river continued to flow, at all events within a period of twenty thousand years? indeed for my part I am of opinion that it would be filled up even within ten thousand years. How, then, in all the time that has elapsed before I came into being should not a gulf be filled up even of much greater size than this by a river so great and so active? As regards Egypt then, I both believe those who say that things are so, and for myself also I am strongly of opinion that they are so; because I have observed that Egypt runs out into the sea further than the adjoining land, and that shells are found upon the mountains of it, and an efflorescence of salt forms upon the surface, so that even the pyramids are being eaten away by it, and moreover that of all the mountains of Egypt, the range which lies above Memphis is the only one which has sand: besides which I notice that Egypt resembles neither the land of Arabia, which borders upon it, nor Libya, nor yet Syria (for they are Syrians who dwell in the parts of Arabia lying along the sea), but that it has soil which is black and easily breaks up, seeing that it is in truth mud and silt brought down from Ethiopia by the river: but the soil of Libya, we know, is reddish in colour and rather sandy, while that of Arabia and Syria is somewhat clayey and rocky. The priests also gave me a strong proof concerning this land as follows, namely that in the reign of king Moiris, whenever the river reached a height of at least eight cubits, it watered Egypt below Memphis; and not yet nine hundred years had gone by since the death of Moiris, when I heard these things from the priests: now however, unless the river rises to sixteen cubits, or fifteen at the least, it does not go over the land. I think too that those Egyptians who dwell below the lake of Moiris and especially in that region which is called the Delta, if that land continues to grow in height according to this proportion and to increase similarly in extent, will suffer for all remaining time, from the Nile not overflowing their land, that same thing which they themselves said that the Hellenes would at some time suffer: for hearing that the whole land of the Hellenes has rain and is not watered by rivers as theirs is, they said that the Hellenes would at some time be disappointed of a great hope and would suffer the ills of famine. This saying means that if the god shall not send them rain, but shall allow drought to prevail for a long time, the Hellenes will be destroyed by hunger; for they have in fact no other supply of water to save them except from Zeus alone. This has been rightly said by the Egyptians with reference to the Hellenes: but now let me tell how matters are with the Egyptians themselves in their turn. If, in accordance with what I before said, their land below Memphis (for this is that which is increasing) shall continue to increase in height according to the same proportion as in the past time, assuredly those Egyptians who dwell here will suffer famine, if their land shall not have rain nor the river be able to go over their fields. It is certain, however, that now they gather in fruit from the earth with less labour than any other men and also with less than the other Egyptians; for they have no labour in breaking up furrows with a plough nor in hoeing nor in any other of those labours which other men have about a crop; but when the river has come up of itself and watered their fields and after watering has left them again, then each man sows his own field and turns into it swine, and when he has trodden the seed into the ground by means of the swine, after that he waits for the harvest, and when he has threshed the corn by means of the swine, then he gathers it in. If we desire to follow the opinions of the Ionians as regards Egypt, who say that the Delta alone is Egypt, reckoning its seacoast to be from the watch-tower called of Perseus to the fish-curing houses of Pelusion, a distance of forty schoines, and counting it to extend inland as far as the city of Kercasoros, where the Nile divides and runs to Pelusion and Canobos, while as for the rest of Egypt, they assign it partly to Libya and partly to Arabia,—if, I say, we should follow this account, we should thereby declare that in former times the Egyptians had no land to live in; for, as we have seen, their Delta at any rate is alluvial, and has appeared (so to speak) lately, as the Egyptians themselves say and as my opinion is. If, then, at the first there was no land for them to live in, why did they waste their labour to prove that they had come into being before all other men? They needed not to have made trial of the children to see what language they would first utter. However I am not of opinion that the Egyptians came into being at the sametime as that which is called by the Ionians the Delta, but that they existed always ever since the human race came into being, and that as their land advanced forwards, many of them were left in their first abodes and many came down gradually to the lower parts. At least it is certain that in old times Thebes had the name of Egypt, and of this the circumference measures six thousand one hundred and twenty furlongs. If then we judge aright of these matters, the opinion of the Ionians about Egypt is not sound: but if the judgment of the Ionians is right, I declare that neither the Hellenes nor the Ionians themselves know how to reckon since they say that the whole earth is made up of three divisions, Europe, Asia, and Libya: for they ought to count in addition to these the Delta of Egypt, since it belongs neither to Asia nor to Libya; for at least it cannot be the river Nile by this reckoning which divides Asia from Libya, but the Nile is cleft at the point of this Delta so as to flow round it, and the result is that this land would come between Asia and Libya. We dismiss then the opinion of the Ionians, and express a judgment of our own on this matter also, that Egypt is all that land which is inhabited by Egyptians, just as Kilikia is that which is inhabited by Kilikians and Assyria that which is inhabited by Assyrians, and we know of no boundary properly speaking between Asia and Libya except the borders of Egypt. If however we shall adopt the opinion which is commonly held by the Hellenes, we shall suppose that the whole of Egypt, beginning from the Cataract and the city of Elephantine, is divided into two parts and that it thus partakes of both the names, since one side will thus belong to Libya and the other to Asia; for the Nile from the Cataract onwards flows to the sea cutting Egypt through in the midst; and as far as the city of Kercasoros the Nile flows in one single stream, but from this city onwards it is parted into three ways; and one, which is called the Pelusian mouth, turns towards the East; the second of the ways goes towards the West, and this is called the Canobic mouth; but that one of the ways which is straight runs thus,—when the river in its course downwards comes to the point of the Delta, then it cuts the Delta through the midst and so issues out to the sea. In this we have a portion of the water of the river which is not the smallest nor the least famous, and it is called the Sebennytic mouth. There are also two other mouths which part off from the Sebennytic and go to the sea, and these are called, one the Saitic, the other the Mendesian mouth. The Bolbitinitic, and Bucolic mouths, on the other hand, are not natural but made by digging. Moreover also the answer given by the Oracle of Ammon bears witness in support of my opinion that Egypt is of the extent which I declare it to be in my account; and of this answer I heard after I had formed my own opinion about Egypt. For those of the city of Marea and of Apis, dwelling in the parts of Egypt which border on Libya, being of opinion themselves that they were Libyans and not Egyptians, and also being burdened by the rules of religious service, because they desired not to be debarred from the use of cows’ flesh, sent to Ammon saying that they had nought in common with the Egyptians, for they dwelt outside the Delta and agreed with them in nothing; and they said they desired that it might be lawful for them to eat everything without distinction. The god however did not permit them to do so, but said that that land was Egypt which the Nile came over and watered, and that those were Egyptians who dwelling below the city of Elephantine drank of that river. Thus was it answered to them by the Oracle about this: and the Nile, when it is in flood, goes over not only the Delta but also of the land which is called Libyan and of that which is called Arabian sometimes as much as two days’ journey on each side, and at times even more than this or at times less. As regards the nature of the river, neither from the priests nor yet from any other man was I able to obtain any knowledge: and I was desirous especially to learn from them about these matters, namely, why the Nile comes down increasing in volume from the summer solstice onwards for a hundred days, and then, when it has reached the number of these days, turns and goes back, failing in its stream, so that through the whole winter season it continues to be low, and until the summer solstice returns. Of none of these things was I able to receive any account from the Egyptians, when I inquired of them what power the Nile has whereby it is of a nature opposite to that of all other rivers. And I made inquiry, desiring to know both this which I say and also why, unlike all other rivers, it does not give rise to any breezes blowing from it. However some of the Hellenes who desired to gain distinction for cleverness have given an account of this water in three different ways: two of these I do not think it worth while even to speak of except only to indicate their nature; of which the one says that the Etesian Winds are the cause that makes the river rise, by preventing the Nile from flowing out into the sea. But often the Etesian Winds fail and yet the Nile does the same work as it is wont to do; and moreover, if these were the cause, all the other rivers also which flow in a direction opposed to the Etesian Winds ought to have been affected in the same way as the Nile, and even more, in as much as they are smaller and present to them a feebler flow of streams: but there are many of these rivers in Syria and many also in Libya, and they are affected in no such manner as the Nile. The second way shows more ignorance than that which has been mentioned, and it is more marvellous to tell; for it says that the river produces these effects because it flows from the Ocean, and that the Ocean flows round the whole earth. The third of the ways is much the most specious, but nevertheless it is the most mistaken of all: for indeed this way has no more truth in it than the rest, alleging as it does that the Nile flows from melting snow; whereas it flows out of Libya through the midst of the Ethiopians, and so comes out into Egypt. How then should it flow from snow, when it flows from the hottest parts to those which are cooler? And indeed most of the facts are such as to convince a man (one at least who is capable of reasoning about such matters), that it is not at all likely that it flows from snow. The first and greatest evidence is afforded by the winds, which blow hot from these regions; the second is that the land is rainless always and without frost, whereas after snow has fallen rain must necessarily come within five days, so that if it snowed in those parts rain would fall there; the third evidence is afforded by the people dwelling there, who are of a black colour by reason of the burning heat. Moreover kites and swallows remain there through the year and do not leave the land; and cranes flying from the cold weather which comes on in the region of Scythia come regularly to these parts for wintering: if then it snowed ever so little in that land through which the Nile flows and in which it has its rise, none of these things would take place, as necessity compels us to admit. As for him who talked about the Ocean, he carried his tale into the region of the unknown, and so he need not be refuted; since I for may part know of no river Ocean existing, but I think that Homer or one of the poets who were before him invented the name and introduced it into his verse. If however after I have found fault with the opinions proposed, I am bound to declare an opinion of my own about the matters which are in doubt, I will tell what to my mind is the reason why the Nile increases in the summer. In the winter season the Sun, being driven away from his former path through the heaven by the stormy winds, comes to the upper parts of Libya. If one would set forth the matter in the shortest way, all has now been said; for whatever region this god approaches most and stands directly above, this it may reasonably be supposed is most in want of water, and its native streams of rivers are dried up most. However, to set it forth at greater length, thus it is:—the Sun passing in his course by the upper parts of Libya, does thus, that is to say, since at all times the air in those parts is clear and the country is warm, because there are no cold winds, in passing through it the Sun does just as he was wont to do in the summer, when going through the midst of the heaven, that is he draws to himself the water, and having drawn it he drives it away to the upper parts of the country, and the winds take it up and scattering it abroad melt it into rain; so it is natural that the winds which blow from this region, namely the South and South-west Winds, should be much the most rainy of all the winds. I think however that the Sun does not send away from himself all the water of the Nile of each year, but that he also lets some remain behind with himself. Then when the winter becomes milder, the Sun returns back again to the midst of the heaven, and from that time onwards he draws equally from all rivers; but in the meanwhile they flow in large volume, since water of rain mingles with them in great quantity, because their country receives rain then and is filled with torrent streams. In summer however they are weak, since not only the showers of rain fail then, but also they are drawn by the Sun. The Nile however, alone of all rivers, not having rain and being drawn by the Sun, naturally flows during this time of winter in much less than its proper volume, that is, much less than in summer; for then it is drawn equally with all the other waters, but in winter it bears the burden alone. Thus I suppose the Sun to be the cause of these things. He also is the cause in my opinion that the air in these parts is dry, since he makes it so by scorching up his path through the heaven: thus summer prevails always in the upper parts of Libya. If however the station of the seasons had been changed, and where now in the heaven are placed the North Wind and winter, there was the station of the South Wind and of the midday, and where now is placed the South Wind, there was the North, if this had been so, the Sun being driven from the midst of the heaven by the winter and the North Wind would go to the upper parts of Europe, just as now he comes to the upper parts of Libya, and passing in his course throughout the whole of Europe I suppose that he would do to the Ister that which he now works upon the Nile. As to the breeze, why none blows from the river, my opinion is that from very hot places it is not natural that anything should blow, and that a breeze is wont to blow from something cold.